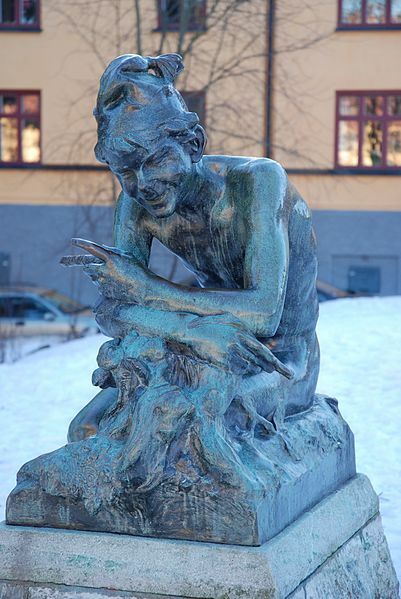 Puck, or Robin Goodfellow is most widely known from William Shakespeare’s play, A Midsummer Night’s Dream, but this is not truly his first appearance, Puck has actually been around in English folklore as early as 1531. The name “Puck” first started as a representation of all mischievous sprites who lead villagers deep into faery if they stray from the path, and many believe “Robin Goodfellow” to be another name for Satan, though this is generally reserved for those with extremely active imaginations. Puck soon became the representation as the sole jester of the Fairy court, ruled over by Queen Titania and King Oberon; it is this representation in Shakespeare’s play that first grabbed my attention. I was recently texting with Britt and Kiki and had mentioned that I had yet to read The Iron King by Julie Kagawa, my first question was, “Wait, is Puck a character?” Kiki responds with a “yes,” and I immediately text back, “sold.” That was really the point where I realized that there are some things in literature that are a sure thing for me, dragons, Celtic lore, and apparently, Puck. I’m not sure what it says about me that one of my favorite characters in literature is one of the most mischievous and spiteful characters written, but some argue that he is simply playful and harmless so let’s go with that for the sake of saving some face – though as I am already team Slytherin and Lannister, I’m not sure there is any going back. I think my adoration of this character comes from the fact that though he is deemed a servant in the land of Faery, he is one of the cleverest beings there; he is cunning, witty and for the most part, extremely jovial and light hearted. 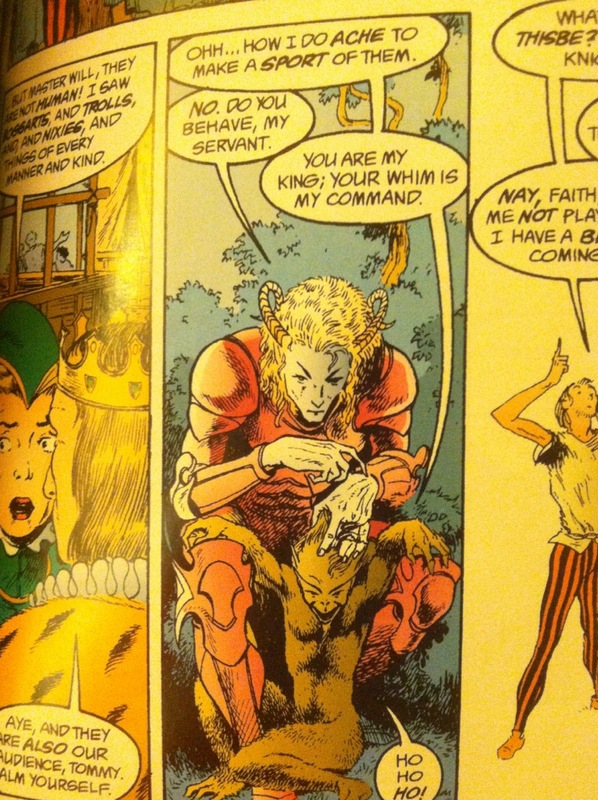 I think I am particularly fond of his duality as he is mischievous but also endearing in the way he cares for some, predominately King Oberon, and Jack o’the forest, from R.F. Long’s The Treachery of Beautiful Things. As a lover of Shakespeare I can’t write this post and not encourage you to read A Midsummer Night’s Dream. In fact, I will even approve if you watch the movie because there is a 1968 version that stars Helen Mirren and Judi Dench! Or, if you want something more recent, there is another film version from 1999 starring Michelle Pfeiffer, Christian Bale, Calista Flockhart, and Stanley Tucci. In literature, Puck has been represented in a few different ways, as I mentioned above, he is a character in The Iron Fey series by Julie Kagawa. Puck is also a main character in The Treachery of Beautiful Things by Ruth Frances Long, The Sisters Grimm series by Michael Buckley and has a brief appearance in Neil Gaiman’s representation of A Midsummer Night’s Dream in his Sandman series. I adored this representation so much that I am ordering a print of the artwork featuring Puck to hang on my wall. What a fun post this was, if you didn’t take part in our character analysis I would still love to hear from you about one of your favorite characters in literature. Additionally I would love to know if there are any representations of Puck that I am missing in literature or media! This entry was posted in Miscellaneous and tagged Puck, robin goodfellow, William Shakespeare. Bookmark the permalink. So much fun learning more about Puck! I’m actually not one for fairy stories, but I will say that when I read The Iron King, Puck was definitely one of my favorite characters!! He’s SO mischievous – exactly – and that’s what makes him so much fun! I feel like it’s a sort of unpredictability and just all around fun. Although now I kind of want to watch A Midsummer Night’s Dream with Christian Bale and Stanley Tucci…. LOVE Stanley Tucci! Puck is definitely an interesting character! There’s a girl who comes into the library where I work, and she is like you. She LOVES Puck. If a story has Puck as a character, she has to read it. Oh yay! Look at you with your new header. You totally reminded me that I never did watch the recent movie version of A Midsummer Night’s Dream. Clearly an oversight on my part. I love that you love Puck so much! I’ll be interested to see how you like Puck in The Iron Fey. I couldn’t take that series, but he was the clear favorite for me in the horrid love triangle. I love trickster characters in general myself, so of course I’m a Puck fan.